Aside from drums and cymbals, drumsticks are one of the most important tools in a drummer’s arsenal. Sticks are the main point of contact with your gear, and have a huge impact on the way you play. Choose the right drumstick for your playing style and it should feel like an extension of your arm. The best drumsticks in this guide include options for every style and budget. The genre of music you play, the hardness with which you hit your gear and your budget will dictate which model of drumstick is best for you. Most stick brands - including the ‘big five’ of Vic Firth, Vater, Zildjian, Regal Tip and Promark - offer a similar line-up of mainstream models, which are great starting points. Most will agree, for example, that a well made 5A model is the best drumstick for rock. Most commonly, wooden drumsticks are made from hickory, a medium weight, durable hardwood. Alternative woods such as oak and maple offer different weight and density. For added durability it’s worth trying sticks made from tougher materials such as graphite or aluminium. This added strength reduces the need to regularly replace drumsticks, but inevitably costs more. Budget drumsticks, commonly made from B-grade hickory, come in at a fraction of the price of premium sticks. Even if these aren’t your go-to model, it’s worth stocking up on budget sticks as back-ups in case your main sticks break midway through a gig or session. These are great drumsticks for kids, too. Perhaps you’re keen to try what your favourite drummer uses? Signature sticks are worth exploring, but only use them if they feel right, rather than because of any artist loyalty. So that’s the overview; now let’s look at key terms to help inform your purchase. When looking at your next pair of drumsticks, you’ll see a number of words used to describe key features: thickness, length, taper and tip. Drumstick thickness has an impact on the overall weight of the stick, and how it feels in your hand. This translates to playing comfort and the amount of power you can unleash on your drums and cymbals. Generally, thicker sticks are more durable, too. Length dictates the potential reach you have between your hands and your drums and cymbals. The taper is the part that gets increasingly thinner towards the tip of the stick. Taper length impacts how the stick feels to play. Longer, thinner tapers promote faster, lighter playing, but these sticks tend to be more fragile. Stick tips come in all shapes and sizes, in nylon and wooden guises. Each style extracts a different sound from your your drums and cymbals. Ball tips tend to elicit more precise, articulate sounds, especially when it come to cymbals. Acorn tips are fuller and warmer. For the best of both worlds, we’d recommend an oval tip. Nylon tips produce more attack than wood tips. For something as seemingly simple as buying a pair of drumsticks, there’s actually a lot to consider. The best approach is to visit your nearest drum shop, feel a range of sticks in your hands and give them a play. You’ll soon find the right model for you. When younger players start learning to play the drums it’s important that they use a drumstick that feels comfortable and manageable in their smaller hands. Full-size sticks can be too long and heavy, making them difficult to control. This can impact technique and, at worst, put off aspiring young drummers before they’ve had a chance to develop fundamental skills and start enjoying the drums. At a pint-sized 13”, Promark’s Hickory Junior Wood Tip sticks are the best drumsticks for kids. They’re shorter than standard models, promoting a more comfortable, natural feel, while a medium taper helps deliver an even balance and rebound, meaning key techniques are picked up quickly. The oval tip is ideal for extracting a well-rounded, warm tone from the drums, no matter what style is being played. Drumsticks might be one of the cheaper purchases for drummers, but if you play regularly and find you break a lot, the cost of replacements soon mounts up. Vic Firth’s Nova Series sticks are made from B-grade hickory, which helps reduce the cost, but they’re no less playable than premium sticks. As with all Vic Firths, Novas are weight and pitch-matched before they leave the factory, so each pair is guaranteed to feel balanced in your hands. At a fraction of the price, it’s even worth keeping a few pairs in your stick bag as back ups in case you run out of your first-choice sticks. In addition to the 5A model, Vic Firth also offer 5B and 7A Novas in a number of different colours. If you’re a full-size human coming to the drums for the first time, it’s vital that you choose a drumstick that gives you the best in feel, length, balance and power as a solid starting point. Then, as you develop, you can start exploring different models that suit your particular playing needs. The 7A size doesn’t feel too big in the hands and is light enough to help you master key techniques early. Vater’s Manhattan 7A is the perfect example of this. It’s a premium quality stick that feels comfortable to play, with a small round tip for neat and defined cymbal playing. In fact, it’s such a versatile drumstick that you may never need to play another model. Vater offers this stick with wood or nylon tips. Playing rock music requires drummers to deliver plenty of power and attack. To achieve this, a solid starting point for any rock drummer is a 5A model stick, and there’s no better example than Vic Firth’s American Classic 5A. These sticks are universally acknowledged as the best for rock, offering decent length, a medium taper for added strength and substantial diameter for the average drummer’s hands. The tear drop tip delivers a potent combination of attack and warmth, helping everyone from softer players to hard hitters coax bombastic tones from their drums. Each stick is coated with a smooth lacquer, which improves comfort and aids grip when your hands get sweaty during long periods of playing. Hickory is the most common drumstick material, however there are plenty of alternatives worth considering. Shira Kashi Oak is dense and heavy - both great attributes for cymbal articulation - making it a great choice for jazz drummers. Japanese oak is also known for its durability, so these Promark sticks should last longer than hickory alternatives if treated with respect – we’re big fans of this considering the higher price. The shorter length and reduced diameter of the Shira Kashi Oak model enables the player to inject greater nuance and dynamic into their drumming, whilst retaining a feeling of balance and control in the hands. At the business end, the oval tip helps extract a darker, warmer tone from your drums. 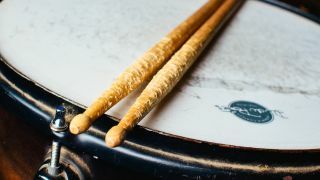 If you’re a heavy metal drummer who finds you’re constantly breaking drumsticks, you may need to explore alternative materials to ensure there’s nothing getting in the way of you and your blast beats. Ahead is known for making extremely durable drumsticks, built around an anodised aerospace-grade aluminium core, and finished with durable polyurethane covers and ‘unbreakable’ nylon tips. Inside each stick you’ll find a vibration reduction system to help absorb the shock of heavier playing. Ahead’s 2B model feels substantial in the hands and is perfectly balanced to promote powerful playing, whilst being light enough to pull off faster beats. Ahead claims their sticks last up to 10 times longer than wooden drumsticks, which takes the sting out of the higher price tag. Modern drummers don’t really subscribe to one particular style anymore, encompassing everything from rock and pop to hip-hop and dance music, often within the same track. As such, they need a stick that can handle the demands of diverse and dynamic drumming. Meinl’s Stick and Brush is a new brand on the scene, but the company is renowned for its forward-thinking approach to percussion products. Their new Hybrid model sticks - including 5A, 5B and 7A models - feature a unique Hybrid tip which starts life as an acorn shape, before being trimmed down to a barrel, enabling dark and smooth cymbal articulation, while the extended length and taper make these sticks ideal for fast fills and intricate grooves. Cymbal giant Zildjian has a huge artist roster, which includes everyone from Dave Grohl and Ringo Starr, to Dennis Chambers and Travis Barker. Many of their artists also play Zildjian-branded sticks, which says a lot about the quality and diversity of the drumsticks they offer. Delve deep into the Zildjian artist drumstick line-up and you’ll find multiple gauges, tip-types and colours to suit your individual tastes and needs. It’s worth trying out the stick of your favourite drummer first, but who knows, maybe you’ll discover the perfect stick bearing the name of a drummer you’d never considered before? It's worth a shot. Nylon-tipped drumsticks produce a very distinctive, defined sound from your drums and cymbals, and it’s an effect that many drummers search for; not to mention the fact your sticks should last longer thanks to the durable nylon tip. Regal Tip founder Joe Calato was the brains behind the original nylon tip back in 1958, and their Nylon Series offers multiple stick models covering multiple genres, all bearing the famous tip. The drumstick brand also guarantees that their nylon tips won't budge, even under the most high pressure playing situations. Stick durability is an issue that has been addressed by every drumstick manufacturer on the planet, all to varying degrees of success. If breaking sticks is a regular occurrence behind your kit, but you don’t fancy going down the fully synthetic route, Promark’s Firegrain sticks could be the most convincing solution yet. These unique-looking drumsticks have been treated to a heat-tempering process that hardens the hickory and boosts strength and durability, all without impacting the feel and tone of the stick. It’s a solution that works, and certainly justifies the slightly higher-than-average price tag.